Public opinion on foreign aid has been widely analyzed over the last two decades. Researchers have found that Americans are becoming less supportive of that type of spending. We find that the Bucknell Institute for Public Policy’s latest survey confirms that most Americans believe we should decrease spending on foreign aid. We also go further in depth and find a strong partisan divide about thoughts on how much to spend and about which countries to spend on. Most recently, Devex contributor John Norris released a, “Foreign Aid and American Public Opinion series,” that began with a comparison of survey results dating back to 1960. Norris developed the following figure using data taken from Cornell University’s Roper Center polling database, iPoll. 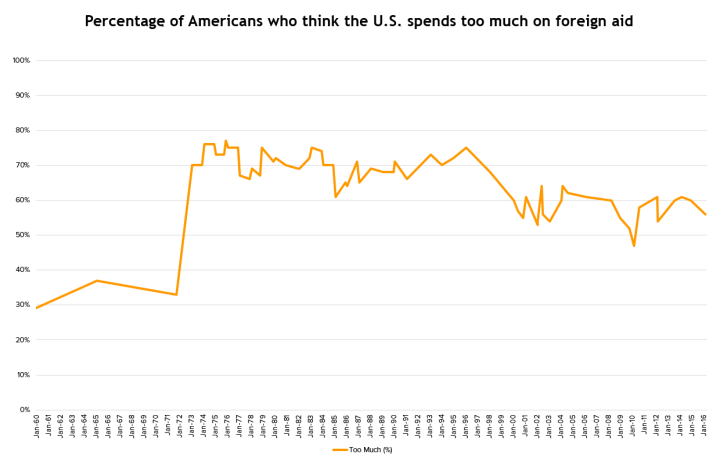 Figure 1 shows that, though there was a dive in the late 90’s, the percentage of Americans who think the US spends too much on foreign aid has been relatively stable, around 60%, throughout the past two decades, except during the latest recession. 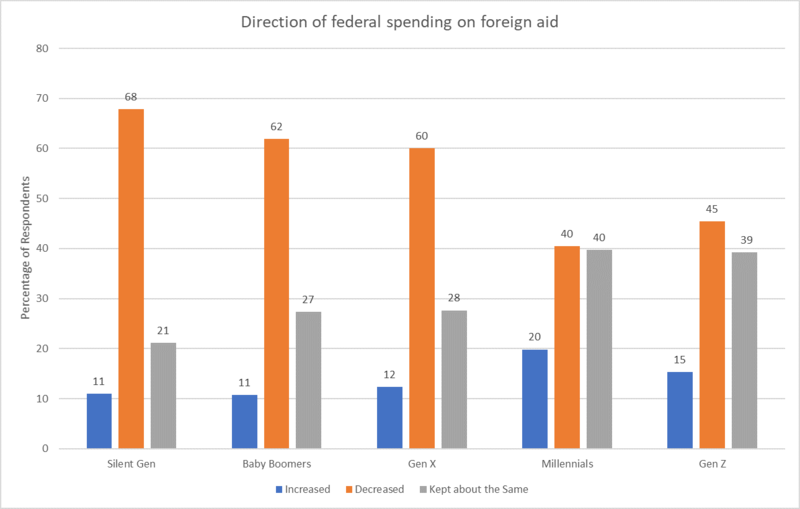 The nationally representative survey, conducted by YouGov for the Bucknell Institute for Public Policy during the week of March 26-31, found that about 54% of Americans believe that we should decrease the direction of federal spending on foreign aid, while around only 14% believe that it should be increased. The rest of the respondents believed it should stay the same. The survey revealed that this is largely a partisan issue. 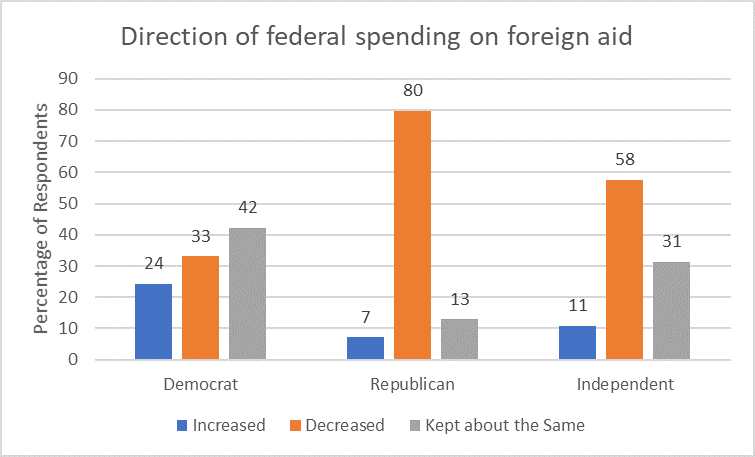 We see that almost 25% of democrats believed that federal spending on foreign aid should be increased, while only around 7% of republicans agreed. Almost 80% of republicans believed it should be decreased. Is this partisan divide based mostly on differing views of Trumps’ America First Doctrine? We find that the results are even more polarized when we look at this question by vote in the 2016 election. 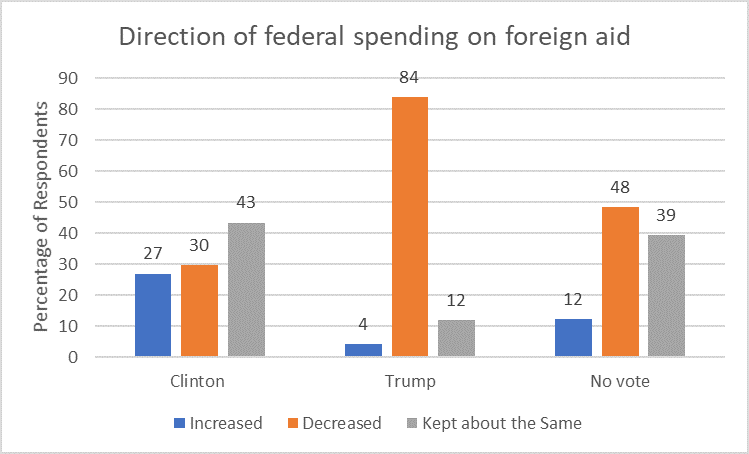 Only around 4% of Trump voters believed federal spending should be increased, while 84% believed it should be decreased. Clinton voters showed less consistency in responses. Trump’s voters certainly seem to be aligned with his America First views. The survey also showed that around 25% of those who have a college degree or higher believe that spending should be increased, while only around 8.5% of those with no higher than a high school diploma agreed. Around 56% of those with no higher than a high school diploma believed that spending should be decreased. Around 45% of those who have a college degree or higher agreed. There was no major distinction among differing income levels or religious preferences, but there was a minor difference found based on race and age. We found that around 60% of whites believed spending should be decreased, while only 47% of blacks agreed. About 10% more blacks believed that spending should be kept the same than whites. We found that there was almost 30% more of those in the Silent Generation that believed that spending should be decreased than Millennials. While there wasn’t a large difference between generations in percentage of those who believed spending should be increased, we see the younger generations tend to favor spending the same rather than spending less. The survey also asked about what our priority should be when we do give foreign aid- to favor our allies or the nations most in need. 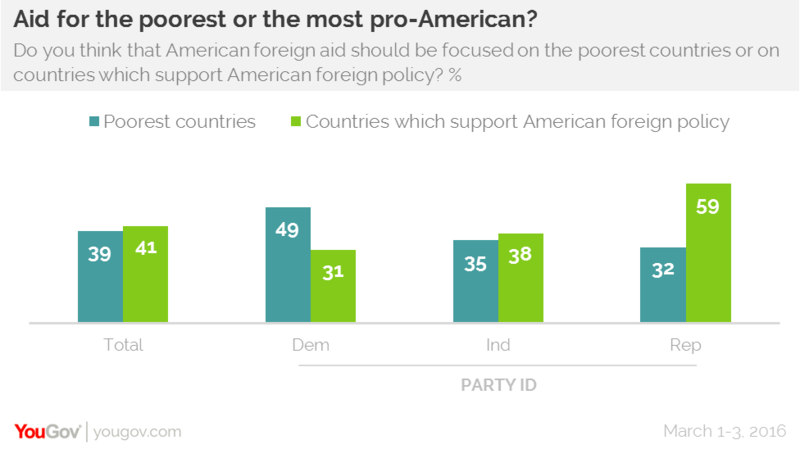 A different YouGov poll asked a similar question before Trump was elected in March of 2016, namely: “Do you think that American foreign aid should be focused on the poorest countries or on countries which support American foreign policy?” YouGov produced the following figure using results from this survey. We see that while there is a partisan divide, Americans only differed by about 2%. BIPP’s survey found that about 55% of Americans believed the priority should be to provide aid to the nations most in need of help. We also found a more distinctive partisan divide than was found two years ago. 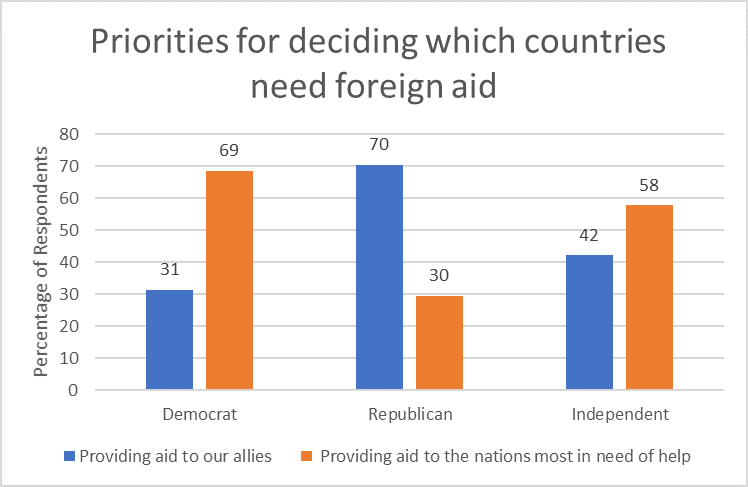 We see that there was about a 40% difference in preference between republicans and democrats, with republicans overwhelmingly preferring providing aid to our allies. Unlike the question of increasing or decreasing spending, this question showed no added polarization in responses between Trump and Clinton voters than existed between Republicans and Democrats. We found again that there were minor differences based on race and gender. About 50% of whites preferred providing aid to those most in need, while around 65% of blacks agreed. Similarly, around 61% of females preferred providing aids to those most in need, while only around 47% of males agreed. For information on methodology, see below. YouGov interviewed 1116 respondents who were then matched down to a sample of 1000 to produce the final dataset. The respondents were matched to a sampling frame on gender, age, race, and education. The frame was constructed by stratified sampling from the full 2016 American Community Survey (ACS) 1- year sample with selection within strata by weighted sampling with replacements (using the person weights on the public use file). The matched cases were weighted to the sampling frame using propensity scores. The matched cases and the frame were combined and a logistic regression was estimated for inclusion in the frame. The propensity score function included age, gender, race/ethnicity, years of education, and region. The propensity scores were grouped into deciles of the estimated propensity score in the frame and poststratified according to these deciles. The weights were then post-stratified on 2016 Presidential vote choice, and a four-way stratification of gender, age (4-categories), race (4-categories), and education (4-categories), to produce the final weight.